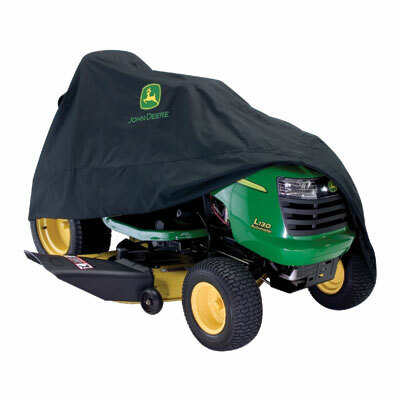 John Deere Deluxe Large Lawn Tractor Cover. 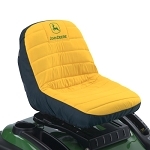 Heavy duty protection for riding mowers. WipeClean reinforced bottom around mower deck. EasyOnside handles makes snugging down cover a snap. Dual reinforced air vents let air circulate and help prevent ballooning in wind. Interior lining and integrated muffler heat shield. Heavy duty fabric will not shrink or stretch and is coated for maximum water resistance. EasyOn split back for fast fitting and easy access after installation.Handy storage pocket reverses into an attractive storage case. Two year warranty. Large fits GT-X400/X700 series. This cover is almost too big for the newer X300 Select series. 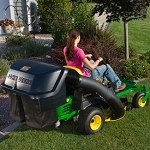 If you own the X300 series, you can check our other listing for the Standard Lawn Tractor Cover. It will fit your X300 series tractor very nicely. This cover fits my x758 just like it should. Covers the whole tractor. This cover is even nicer than I expected. Very good quality, and fits my X584 like a glove. I store my lawn tractor indoors, but it's kind of a dirty environment, and this cover keeps the John Deere looking new. The built-in storage pouch is clever! Very highly recommended. I occasionally have to leave my X540 outside when the landscape rake and tractor shovel are attached. I this cover is well made and plenty big to cover the tractor, tires and lift mechanism for the tractor shovel. It is lightweight so it is easy to get on and off and the elastic keeps it firmly in place. Great service from Green Dealer, too. I have bought other accessories from them. It fits great and is very high quality. I would expect it would cost twice as much as it does.